Sometimes, students face difficulties when writing their papers. We can help you with that. We will write a custom research paper on The Great Gatsby, an essay or do editing for you to make your studies easier. The World Literary community knows many writers with a tragic fate, who left the writing stage too early without having been given a chance to realize their full potential. Talented masters of the words died of loneliness, alcoholism, constant feeling of desperation, indifference, and lack of understanding. Each case like this attracts more and more attention towards the flaws of our culture and the insensible ways our society treats people who are different in one way or another and how we waste the years of our life given to us. At the beginning of the 20th century in between the two World Wars, one of the biggest tragedies was the death of a great American author of The Great Gatsby, Francis Scott Fitzgerald. The Great Gatsby is Fitzgerald’s masterpiece. All of the author’s other novels have both positive and negatives sides to them. In Tender Is The Night, the reader will see more of psychological observations on human nature. The Last Tycoon was his attempt to analyze the American power-class and their reality, and it could have overshadowed The Great Gatsby but was never finished to acquire its polished form. The book has particular traits that are unique and extraordinary. 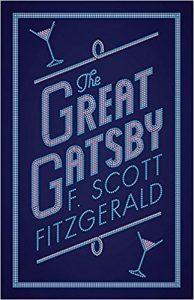 Despite the tragic events portrayed, the text radiates the untamed desire to celebrate life, and infinite confidence in one’s abilities which is so typical of young Fitzgerald ‘s personality. The book was written early enough in the times when the author still hadn’t allowed the bitterness and coldness of life get through to his writing. It screams triumph, festivity, and celebration in every sentence and every character. Fitzgerald started his career with publishing a novel about American student life in 1920 titled This Side of Paradise. It instantly made him popular and wealthy. He went from being an unknown provincial person who thought he could write as a well-situated man to one who lived in one of the most expensive New York hotels. He and his wife literally lost count of the money they had and the young couple lived life fast, occasionally making the front pages of the newspapers. It seems like a fairy tale, yet it is a real story. Don’t get it wrong. The Great Gatsby author was really a talented and bright man. Moreover, he fiercely believed in himself and was optimistic about his prospects from the very beginning. After the success of his first book, Francis started writing short stories for magazines. It paid well and made him even more popular, but many of the well-known and respected literary minds of that time advised him against “selling his soul and stripping his talent” for the shallow and overly popular publications, particularly The Saturday Evening Post. A famous American novelist, Charles Norris, warned the writer that the magazines would strip him to the buff, then throw away and forget his name the next day. Some critics still agree that this is exactly what happened to the great author. When he published his The Beautiful and Damned in 1922, it was still radiating with optimism and glory, yet the tone of the text demonstrated some worries about the fate of those he praised for being beautiful and damned. His most known book that later turned into an even more popular movie, The Great Gatsby was written in France in 1925. In this book he reveals himself as a painter who votes against the capitalistic tendencies in the society, separating himself and his ideals from esthetic and moral standards of the people who surrounded him back home. Despite showing the power and depths of Fitzgerald’s talent, this creation didn’t have much commercial success in the United States. This was because the audience was expecting more of a jazz rhapsody from him, having read and got used to many of his magazine stories. The publishing of The Great Gatsby marks the beginning of the tragedy of its author’s life. Despite partial bright sparks in his career, he becomes very unsatisfied with his talent and his mode of life. He ruins his health by turning to alcohol, scandals, and drama. The illness of his wife only worsened his mental condition. Fitzgerald died of a heart attack before his wife died and was even denied a burial at his family’s Catholic cemetery plot. Nick Carraway is from a respected and well-off family from the Midwest. 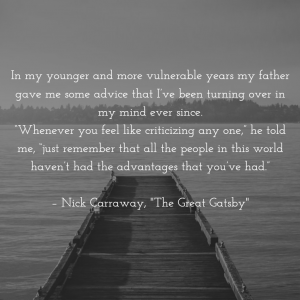 At first, we can’t help but wonder whether Nick is the one who wrote The Great Gatsby? He studied at the Ivy League school, went to war as a soldier, and then moved to New York in 1922 to study credits and bonds. He settled in a house in West Egg, a nice place in Long Island that is expensive yet not too well known. For just 80 dollars a month he got a nice house and wealthy neighbors, among which was Jay Gatsby. At that time, wealthy people who have made their fortune not so long ago and were keen to show off their prosperity and success inhabited West Egg. East Egg was a little bit more fashionable, and that’s exactly where his cousin Daisy lived. Daisy has made it in life, judging by the standards of that time. She is married to Tom Buchanan, a fabulously wealthy man, who even owns his stable for playing polo. Tom and Nick went to school together and didn’t manage to build a very close friendship. Nick always thought Tom to be arrogant and full of himself. Tom and Daisy’s relationship leaves much to be desired. Tom started cheating on his wife already during their honeymoon. He couldn’t wait to tell Nick about his new affair with Myrtle Wilson already in the first evening they met after a long time. Daisy knows about it, and it bothers her. After the first encounter at his cousin’s house, Nick leaves with an impression that they should part. Nick takes a trip with Tom to New York. They visit an apartment at which Tom spends time with his mistress. She lives in an industrial district of New York and is married to a car repair engineer. The apartment is filthy, and so are the people who are there. They have a party that leaves Nick indifferent. At the end of the party, Tom breaks Myrtle’s nose for mocking Daisy. Very often Nick hears music and party sounds from the house of his neighbor, Jay Gatsby. Many famous people frequent these parties. The nice music, live orchestra, huge tables, expensive alcohol, Rolls Royce as a taxi to New York… No summary of The Great Gatsby is enough to describe those crazy nights. After each party, at least a dozen of housekeepers clean up the consequences of previous nights. Finally, Nick gets an invitation to one of these parties. Mixing with people, he learns more rumors about the owner of the house than the truth. People say that he murdered somebody, or that he is a German spy. Men think of him as a fat and ugly man, ladies dream of him as a son of a devil. An important point that shouldn’t be missed in any Great Gatsby summary – Nick was one of the few characters who got an invitation to a party. People didn’t get an invitation to the Gatsby parties, they simply came and had fun! When we finally meet the legendary Jay Gatsby, he is different than what most readers expect reading The Great Gatsby summary: he is cool, reserved, keeps his distance. It seems that the public that used Gatsby for having fun on the premises of his house paid him by not meddling in his affairs. Upon closer look, he turns out to be a great listener and an interesting person. At the party, Nick also meets Jordan Baker – a beautiful young lady whom he met for the first time while visiting his cousin Daisy. Jordan finds out a secret that Gatsby is in love with Daisy. They knew each other before. They met when Daisy was 18 and Jay was just a soldier without any money in his pockets. When Jay went to the war, Daisy married Tom. What Jay doesn’t know is that right before the wedding, Daisy got drunk with her friend, threw away her wedding present – an expensive pearl necklace, and begged her friend not to let her marry Tom. Now Jay is rich and ,famous and still loves Daisy. He knows exactly where she lives and how her life turned out so far. But he doesn’t dare approach her. That’s why so much effort for the parties and notorious lifestyle was to attract the attention of a woman he truly loves. So if you ask a person to tell you what is The Great Gatsby about in just one sentence – it’s about extravagant things a man could do for the woman he once lost but continues to love. Nick arranges an “accidental” meeting for Jay and Daisy in his home. After a couple of weird moments, the love between them reignites again and they begin an affair. After Daisy entered Jay’s Gothic mansion house for the first time, which was very important to him, the parties became less frequent and almost stopped altogether. He changed the maids to those “who knew how to keep quiet”. Needless to say, when Tom Buchanan met Jay Gatsby, he liked neither his house nor his parties, or the man himself. He started wondering and doubting the origins of Gatsby’s wealth. After a clash between Tom and Gatsby over who will stay with Daisy, Daisy is driving Gatsby’s Rolls Royce and accidentally hits Myrtle. Tom decided to take advantage of the opportunity and persuaded her husband, George, that the driver was Gatsby. George, overwhelmed with sorrow and rage, kills Jay and then himself. Only three people came to Gatsby funeral: his father, Nick and one of the party lovers. Even though Nick made thousands of calls to people who used to be at Gatsby’s house every weekend. Tom and Daisy left town without letting anybody know where they were headed. They were a careless couple, they broke the things and relationships who surround them and then ran away and hid behind their money, letting others clean up after them. That’s it for a quick The Great Gatsby synopsis. But the essence of the book isn’t in a plot, which is quite simple and short. The reason why the novel resonates with so many readers are the all the symbols that are in it, and especially in its characters. The biggest question of any Great Gatsby characters analysis is which character impersonates the author himself? Is it Nick Carraway or the legendary Mr. Gatsby himself? Let’s try to find out. Nick Carraway is the narrator of the book. Unlike Jay Gatsby, he is from the “old rich” – he inherited his money from the family of hardware business owners and is constantly surprised by the lifestyle of the “new rich”. The money his family provided him with was enough to live a decent, but not a very posh life: his house was one of the smallest in the West Egg. He is well-educated and has a well-rounded personality overall. He didn’t exhibit any desires to show off or prove to others that he is rich and successful. Nevertheless, he had very high standards both to his living conditions and people around him. He likes literature and went to war. Quite a strange combination, but those were the attributes of a proper man of that time. At the same time, he can’t restrain from judging the people he meets. At the end of the book, Nick is disgusted with the lifestyle he has experienced in New York and heads back to his home. He is mostly disgusted with what he became under the influence of the people he met. He realizes that his aspirations are corrupted by money and lies and that the American dream is over. Though Gatsby’s name is in the title of the book, the character is actually pretty simple. Jay Gatsby started as Jimmy Gatz, a young boy from a farmer’s family ashamed of his origins, but he had a dream: to escape his position and become rich and famous. His father saw the boy’s tendency to develop and move forward fast and helped him change the course of his life. The reader meets the protagonist already as Jay Gatsby, who is living in an extravagant house next to Nick Carraway and is constantly throwing loud parties for hundreds of people. He might have made his money illegally, but neither the author nor society seems to care. Jimmy Gatz made his fortune once he met Dan Coddy and worked on his boat for 5 years. The millionaire left him 25,000 dollars after his death, but he never received the money. He used his experience to make his dreams come true, but are his dreams really worthy of him? 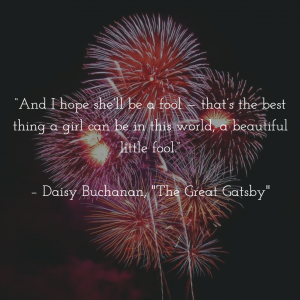 Even though Gatsby had met many women in his life, Daisy was the first lady from the upper society that he met and fell in love with. He had been to her home many times, together with other officers. He liked the beautiful house and liked her company but knew that he didn’t deserve it at the time. When they parted, he went to stock his pockets with money and positions while she hid behind her rich house, in her expensive and life full of perspectives. But the weird feeling that they were meant to be a husband and wife remained. In her letters, Daisy was impatient and bored. She was young and wanted to live her life in the here and now, and to live it well. She was ready to make a decision but needed an incentive: love, money, benefit, fame, anything. That’s where Tom appeared which helped made her decision easy. They had a daughter whom Daisy never discussed during the whole book. At the very end, she lets the man she loves take the blame for her crime. She then runs away with her cheating husband, leaving everything behind for the sake of tranquility. Despite some incidental events, her life was easy, careless, and shallow. Tom Buchanan is a commanding and forceful character. He is rich and arrogant. He likes sports, pays great attention to his looks, and is very possessive. He cheats openly on his wife with Myrtle Wilson, but becomes very annoyed when he finds out about her fling. He is willing to do whatever it takes to break Daisy and Jay’s affair not for the sake of love, but for the sake of self-esteem. In the end, he doesn’t seem to care about the crime his wife committed, but cold-heartedly takes advantage of the opportunity to destroy his opponent. Jordan Baker is a careless traveler of the years of her life. From the young age, just like Mayer Wolfsheim, she got used to silly actions and was even planning to make a fortune by cheating golf players. She has very good instincts and manages to avoid smart and clear-sighted people. She feels confident among those who can’t even conjure a thought that she might be dishonest. Just like in the case of Buchanan, she is used to getting away with all her small crimes, even though they were frequent. Meyer Wolfsheim is a real predator of the book. He is making a fortune by inventing different affairs. He plays the “too rich to fail” card cheating on 50 million baseball fans and getting away with it. He helped get Gatsby out of poverty, but only because he saw the benefit in it for himself. With Mayer Wolfsheim, the author demonstrates the gradation between the rich of that time. Despite wealth, Wolfsheim didn’t make it to the true upper class but was still a desired guest for many companies. Gatsby’s natural talents, fearlessness, and agile mind allowed him to get unbelievably rich. Just like the author himself, he didn’t know what to do with his funds. He earned them through illegal ways of selling alcohol when it was prohibited to do so. The author speaks very little about the way the protagonist made his fortune. Crime, however is not one of The Great Gatsby themes. At least not in the classical interpretation of the book. The wealth itself and the prosperity it brings is all over The Great Gatsby themes: one way or another Gatsby made it in life and the reader is overwhelmed with the descriptions of his huge villa, yachts, expensive cars, luxurious interior designs, amazing parties. Life is easy for those who are rich and those who are lucky enough to know them. Love is often noticed as one of the main themes in The Great Gatsby. Love for another person and love for money. It’s important to say that in order to get close to Daisy, Jay (who was Jimmy at that time) has to lie to her. She was a young beautiful girl popular among the officers and in order to prove that he’s worthy of her, Gatsby lied about his origins and financial standing. Love, money, and lies are all intermingled throughout the book. Aristocracy is also a theme of The Great Gatsby. Here we discover the upper class of America from their downsided viewpoint. The bourgeoisie built their life on cold calculations of cost vs. benefits. They are simply curious about other people’s money and worship whoever has more. Gatsby’s surroundings don’t care about the origins of his money. They do think he might be a criminal to spend so much money on other people, but it doesn’t bother them much and the number of party guests keeps growing. Another Gatsby theme is the American dream. With a not-so-happy ending, Gatsby still achieved what he wanted in life through hard work. He was a poor farmer’s son who made a lot of noise in the busiest city in the country – this is one of the more dominant themes of The Great Gatsby and many other American books of the 20th century. The book is full of different symbolism examples that are typical for American literature of the 20th century, but also unique for Fitzgerald. Most of the critics agree that any analysis of the examples of symbolism should start with the interpretations of the American dream concept. The protagonist of the book is pursuing his craziest dreams. He is a child from a poor family who dreams of money and the colors it brings to one’s life. This dream did indeed come true for him. But Jay paid a lot for his success. This is where the decline of the American dream concept is especially noticeable. It wasn’t the honest ways that brought him there. Education from a top school, perfect war record, and pure love for a girl wasn’t going to make it. In order to enter into the upper class society, Gatsby did different things, including running a shadow business. The American dream in The Great Gatsby, particularly for the protagonist was simply to be worthy of the woman he loved. That’s what the Green Light at the end of the lake is for – a hope for being happy in the future. The money was a goal but also a tool to achieve the dream of marrying Daisy. While love isn’t one of the major meaningful symbols of the book, the social standards of that time are. For Gatsby it wasn’t enough to love the girl and receive love in return: Daisy couldn’t marry a man of a lower class. The Valley of Ashes between West Egg and The Big Apple also signified the gap between the two lovers. In the end, the reader is still left wondering if Daisy would be as impressed with her long-forgotten lover if he appeared in front of her being the same poor officer that he used to be? Other symbols in The Great Gatsby book include infidelity and weakness of the characters. Finally, one of the more subtle but key components of symbolism in The Great Gatsby is the fickleness of happiness. After finally acquiring everything he wanted, Gatsby doesn’t realize that his current situation is temporary. Even when Daisy almost agreed to leave her husband, she is still more impressed by his wealth than by his personality. The first doubt planted by her husband about the origins of Gatsby’s wealth breaks her confidence. Once he loses the old dream forever, Gatsby is left with nothing to wish for. The author remarks that his character paid too much for the dream that was isolated and didn’t have a chance to grow, develop, or transform into something new. It is like Gatsby’s aspirations were stuck in time and space and the writer had no choice but to kill his protagonist once they were gone. When was The Great Gatsby written? – The book was written between 1922 and 1924. The author started writing it in New York and finished the text while spending his vacation in France. When was The Great Gatsby published? – The novel was published on April 10, 1925. It was met with some interest but was then forgotten during the period of the Great Depression. After regaining its popularity in the 1950s, the book has stayed on the top of the reading preferences ever since. It is now included in the school literature list in the USA. In 1998 it was named among the top three English-speaking novels of the 20th century. What is The Great Gatsby genre? – The novel belongs to the Modernism literature and is a bright representative of the Jazz Age period. What is The Great Gatsby setting? – The events of the text take place in the summer of 1922 on the premises of New York and Long Island. What is The Great Gatsby modality? – The Great Gatsby author managed to stay objective in the writing. Fitzgerald reveals the personality of his characters through their actions and facts from the past. Rarely does Nick Carraway (the narrator of the story) shows his attitude towards the events. What are The Great Gatsby main topics? – The story unfolds around American dream, emptiness and desolation of the aristocratic class, a fierce desire of a poor boy to get rich to be worthy of the woman from the upper class, and the price of becoming rich and famous. Was The Great Gatsby a commercial success? – The author considered the book a failure. The sales amounted to 24,000 copies, which was less than his previous books. He received all together $4,000 of advance and $1,900 as the honorarium, but he could get as much as $4,000 for writing a short magazine story in a couple of days. Despite bad sales, the reviews on the book were very positive. In the novel’s opening lines, Nick Caraway recounts this important piece of counsel from his father. He presents himself as a character who is simultaneously privileged and empathetic. This statement establishes, first, the high socioeconomic status enjoyed by most of the protagonists in the novel. Though Nick is far from the wealthiest character, his ties to old money and academic pedigree as a Yale graduate bring him into contact with the élite of both West and East Egg. Yet this line also immediately creates a level of distance from those élite: Nick is aware of his position and actively seeks to treat those from all walks of life with respect. He thus establishes himself as not only an accepting character, but also a relatively impartial narrator. Fitzgerald gives us, then, a character who is both inside and outside of this privileged social sphere. At times he is fully enamored by the culture, while at others he points out the flaws in its decadence. The implication here, after all, is that many others with similar “advantages” as Nick are far more critical of those who hail from different social backgrounds. The more accommodating perspective that will pervade the novel, this line implies, comes from an early piece of “advice” from Nick’s father—indicating that his views are shaped by key developmental experiences. Daisy reflects while Nick visits her on her relatively despondent state of mind. As an example, she tells the story of her daughter’s birth, during which she exclaimed this disconcerting wish for the child. This passage gives excellent insight into Daisy’s character and relationship with Tom. Her desperation at the moment of her daughter’s birth was partly caused by his absence—which is characteristic of his generally selfish and neglectful nature. Yet Daisy’s hope for her daughter is, intriguingly, not that she has a supportive husband or can take care of herself. Rather, she wishes her to be a “fool”: someone who is too simple or ignorant to correctly perceive what is happening around them. The implication, here, is that Daisy wishes she herself could be a fool, for it would allow her to enjoy the luxuries of Tom’s life without being aware of his unfaithful behavior or the hollowness behind the extravagance. The Great Gatsby by F. Scott Fitzgerald. From novelinks.org. Contents: Anticipation Guide, Before During and After Lesson Plan, During Reading Strategy, Question Answer Relationships, Concept Vocabulary Analysis, Think Aloud, Reading Activities, and more. F. Scott Fitzgerald Lesson Plans @Web English Teacher. Contains links to various sites with lessons on F. Scott Fitzgerald’s life and on The Great Gatsby. Teaching ‘The Great Gatsby’ With The New York Times – NYTimes.com Multiple lessons plans linked which are designed to keep The Great Gatsby current and relevant. Contains archives from The New York Times, articles on Class and Wealth, Gatsby Characters, The Novel’s Setting, the Fitzgeralds, and Adaptations. Google Images of F. Scott Fitzgerald. The Great Gatsby (1926) from IMDB – Internet Movie Database. Film directed by Herbert Brenon. Writing credits: F. Scott Fitzgerald (novel), Becky Gardiner (writer – filmography). Plot Summary: “Nick Carraway, a young Midwesterner now living on Long Island, finds himself fascinated by the mysterious past and lavish lifestyle of his neighbour…” Runtime: 80 min. Country: USA. Color: Black and White. Sound Mix: Silent. Trivia: “No prints of this film are known to survive. Check your attic.” User Comments, Message Boards. The Great Gatsby (1949) from IMDB – Internet Movie Database. Film directed by Elliott Nugent. Writing credits: Owen Davis (play), F. Scott Fitzgerald (novel). Plot Outline: “In this ‘adaptation’ of the F. Scott Fitzgerald novel, a Jazz Age bootlegger learns the hard way about the wages of sin.” Cast: Alan Ladd (Jay Gatsby), Betty Field (Daisy Buchanan), Barry Sullivan (Tom Buchanan), Shelley Winters (Myrtle Wilson), and others. Runtime: 91 min. Country: USA. Color: Black and White. Sound Mix: Mono. User Comments. Message Boards. The Great Gatsby (1974) from IMDB – Internet Movie Database. Film directed by Jack Clayton. Writing credits: Francis Ford Coppola (screenplay), F. Scott Fitzgerald (novel). Genre: Drama / Romance. Tagline: Gone is the romance that was so divine. Plot Summary: Nick Carraway, a young Midwesterner now living on Long Island, finds himself fascinated by the mysterious past and lavish lifestyle of his neighbor…. User Comments, Photo gallery for The Great Gatsby (1974) – 24 photos, Cast Overview Robert Redford (Jay Gatsby), Mia Farrow (Daisy Buchanan), Bruce Dern (Tom Buchanan) and others. Runtime: 144 min. Country: USA. Color: Color (Eastmancolor). Sound Mix: Mono. Trivia: Goofs: Anachronisms: Quotes: Awards: Won 2 Oscars. Another 5 wins ; 3 nominations. User Comments. Message Boards. The Great Gatsby – Opera (1999). John Harbison, Composer: “The Great Gatsby is a music-driven opera … a generously proportioned opera based on a very compact novel … the opera differs from the novel in many ways … Gatsby is not shadowy and mysterious, he must be heard. … Fitzgerald’s magnificent portrait of the Jazz Age – in all its idealism, hopes, excesses, nostalgia, and decadence – remains one of the most widely read American novels.” Includes Synopsis and Reviews. The Great Gatsby (2000) (TV) from IMDB – Internet Movie Database. A made-for-TV movie directed by Robert Markowitz. Writing credits – Writers Guild of America (WGA): F. Scott Fitzgerald (novel), John McLaughlin (teleplay). Tagline: “He risked it all to give first love a second chance.” Cast: Mira Sorvino (Daisy Buchanan), Toby Stephens (Jay Gatsby), and others. Country: UK / USA, Color: Color. Sound Mix: Stereo. Quotes. User Comments. Message Boards. PBS – JAZZ A Film By Ken Burns: Jazz in Time – Roaring Twenties. An Excerpt from Jazz: A History of America’s Music. Contains a brief biography of jazz music in the 1920s as well as the audio example “Cake Walkin’ Babies” by Clarence Williams Blue Five (recorded January 8, 1925). The Red Hot Jazz Archive – A History of Jazz Before 1930 by Scott Alexander. Includes photos, suggested reading, Red Hot Bands, 1895-1929, Jazz Films – short Jazz films made in the late 1920s and early 1930s, Jazz Essays, Red Hot Musicians, 1895-1930. 1920s Fashion ; Music by Jesse Boland. A look into the Roaring Twenties, it’s fashion and it’s music. With pictures. The Great Gatsby Essays | GradeSaver. Academic essays for citations. Written by students to give critical analysis of F. Scott Fitzgerald’s The Great Gatsby.